Find your ideal wardrobe must-have here at Mainline Menswear from the extensive collection of t-shirts by Just Cavalli. 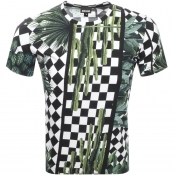 Shop Just Cavalli t-shirts, including single block colour designs, small logo prints, or an extensive array of patterns and graphic prints - so theres something to suit your own original style. We sell original styles including but not limited to Tiger Logo tee, Geisha tee,. Japanese. Skull tee and many more.